My eyes got big and I just jogged away stunned. Needless to say that day on I went from a diva first-rounder to a blue collar tight end determined to be great. Twelve years later, it's the best advice I received. 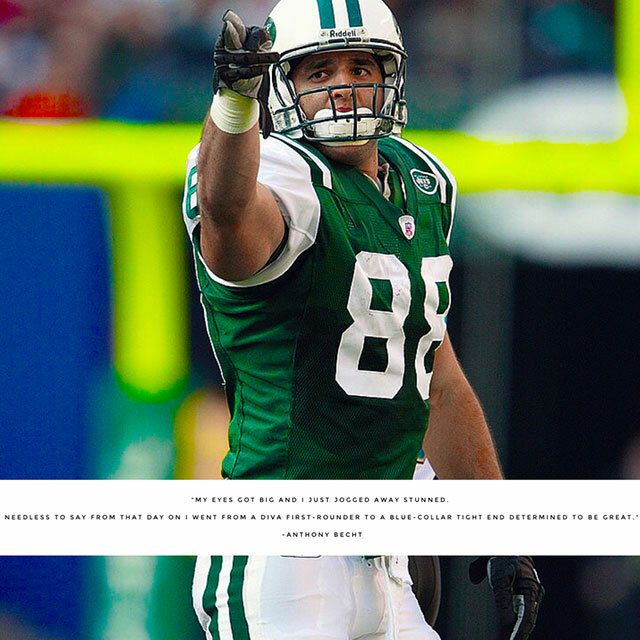 In 2000, I was drafted in the first round by the Jets as a tight end. In my first preseason game we played the Saints, and I had three catches and a touchdown. The next day at practice I hear Bill Parcells, our GM, call me over from across the field. I jogged over with my chest popped out, assuming he was going to tell me how good I looked the night before versus the Saints. When I got over to him he said, and I quote, "If you ever block that bad again in a game, I'll send you back to West Virginia (the school I played for) so fast you won’t know what happened."